A round-topped stele showing the deceased sitting on a stool, a long staff topped by a mace-head in his left hand. A female dog sits under the stool. In front of him is a pile of offerings including vases, loaves of bread, the forelegs of oxen, a fowl, vegetables etc. 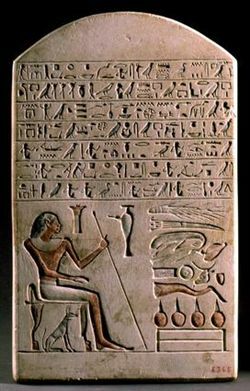 Above the scene are 7 horizontal lines of hieroglyphs. Let one remember Samontuweser! He says: "I was director of the hall, steward, overseer of services in the property of Montu, the one who invested with their authority the officials of the palace of the prince by anointing them, being a man who cares for his city. I owned beautiful artificial lakes and tall sycomore trees. I was one who founded a vast estate in his city and excavated his tomb in its cliffs. I established a water supply for my city, I ferried its inhabitants across in my boat. I was a wise man in ruling my subordinates until the day will come when I shall be blessed. I handed this on to my son in my will. S.Bosticco, Le stele egiziane dall'Antico al Nuovo Regno, I, Roma, 1959, pgg. 24-25, n. 18. W. Seipel, Aegypten. Götter, Gräber und die kunst 4000 Jahre Jenseitsglaube, Linz, 1989, pgg. 127-128, n. 94.